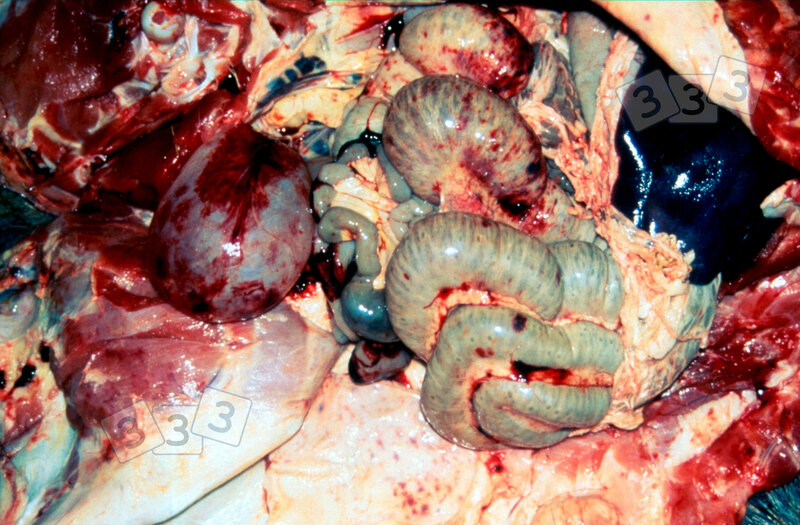 Haemorrhagic lesions within a carcass should always raise suspicion of Classical or African Swine Fever (which are pathologically indistinguishable) as would multiple sudden deaths. As well as occuring on serosal surfaces, haemorrhagic lesions are seen in lymphatic tissue —especially the spleen, lymph nodes and tonsils— and parenchymatous tissues. Skin lesions suggestive of septicaemia may also be evident. In more chronic cases button ulcers may be present in the mucosa of the large intestine following a period of high fever prior to death. Reproductive failure in the form of abortion can occur as well as nervous,enteric and respiratory disease in any age pig. The clinical and epidemiological picture can be useful to differentiate PDNS the pathology of which can suggest haemorrhagic disease. Illness affecting a wide age range of animals would suggest ASF/CSF. If there is any doubt ASF/CSF suspicion should be notified and investigated. African Swine Fever —against which there is no vaccine— has become widespread in eastern Europe following its initial incursion via Georgia in 2007 and subsequent spread through Russia. It now represents a very real threat to all European pig populations especially where biosecurity lapses occur and wild boar populations are prevalent.